The UK telecoms regulator has moved the goalposts for measuring geographical coverage, in turn giving politicians the chance to look like they’re doing something. 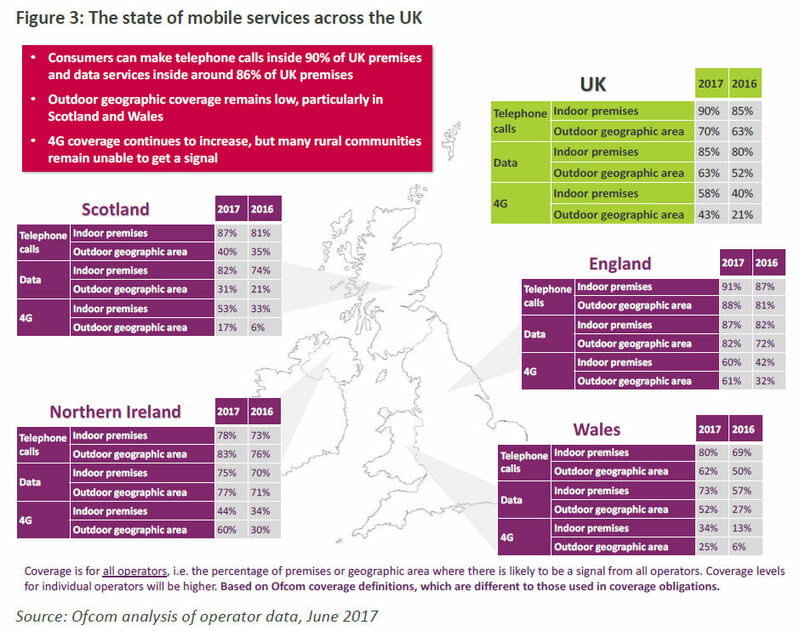 In its Connected Nations Report 2017, Ofcom announced it has been doing some of its own testing and found that the state of UK geographical coverage is worse than it had previously thought. This is significant because geographical coverage has been a condition of some licenses and it has also been a focus for politicians ever since David Cameron got the hump about not being able to check the football scores on holiday. Speaking to operator sources Telecoms.com learned there are many question marks around this shifting of the goalposts by Ofcom and the subsequent political opportunism by Lord Adonis, the Chair of the National Infrastructure Commission – a body that seems to have been set up to moan about UK telecoms. Firstly, Ofcom has been far from transparent about its methodology. Its new criteria for ‘coverage’ are “Nearly all 90 second voice calls to be completed without interruption and speeds for nearly all data connections to be fast enough for users to browse the internet and watch mobile video effectively.” The latter, apparently, requires a minimum data throughput of 2 Mbps. But how sure can Ofcom be of the extent of those areas that fall short? Did it measure every square foot of the country and if so how? And then there’s the unilateral nature of the revision. When it imposed geographical coverage obligations on operators originally there would have been an agreed set of criteria, which those operators have presumably been striving to fulfil. It hardly seems fair to both shift the goalposts and then immediately condemn operators for flouting the new criteria. Which brings us onto Adonis. He wasted no time whatsoever in writing an open letter to Sharon White – the head of Ofcom – lamenting how terrible it all is and, of course, how much he cares about the poor, old UK population that has to struggle under the yoke of this medieval infrastructure. “Despite licence obligations that were intended to provide coverage to 90% of the UK’s landmass by the end of 2017, large parts of the country remain without reliable coverage – with almost a third of the UK’s geography unable to receive a signal from all four operators,” wrote Adonis. The first quote reveals another major problem with this Ofcom manoeuvre – the need for 90% of the country to be covered by all four operators. We would imagine that Three, which is seldom slow to moan, is likely to be especially aggrieved at this since it has the smallest network. And, for that matter, why is it so important that we’re able to choose between four providers when we’re at the top of a Welsh mountain? Then Adonis starts banging on about making better use of existing spectrum. We have to wonder what existing spectrum he has in mind and how he thinks that spectrum is being under-used. He presumably knows that higher frequency spectrum won’t address coverage issues so he must think operators are sitting on sub-1 GHz spectrum, which seems unlikely. Ultimately, when the state starts grandstanding about telecoms provision you have to question how it positions it. If it’s a utility then surely the government should be doing more to help resolve these issues than just moaning, such as facilitating sites on public land. If it’s a private enterprise then it should either chuck it some public money or shut up. Sadly neither seem likely.